Didn’t Hillary Clinton say once the left takes the House and/ or Senate they would be civil? 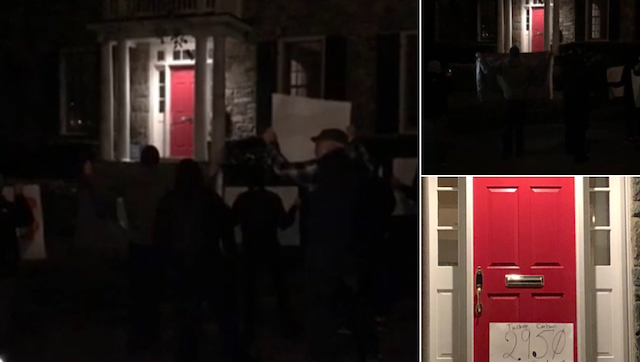 Apparently not as Antifa, carrying out Maxine Waters’ order to harass conservatives, showed up at Fox News’ Tucker Carlson’s home in the middle of the night to harass him and his family. They issued a direct threat to Carlson, “we will fight! We know where you sleep at night!” to end his acts of hate and racism. These “protestors” claim the Fox host is responsible for acts of violence committed by the police, attacks on trans women, and is pushing policies of hate. Do Not trivialize these people, it’s dismissive and dangerous as they will only continue doing what they do trying to one up themselves. These terrorists are trying to start a fight on America’s streets, do they understand they’re picking a fight with the same people who have been buying guns, ammo and properly training with them at record levels since obama was elected? Democrats won power back in the House and that as many of us know isn’t enough. They want complete and total rule over all of us. And to you moderate democrats out there, be warned, if you don’t do what these terrorists want you’ll be in their crosshairs too! Now that Sessions is out at the DOJ maybe we’ll get an Atty General with a spine who will use the rule of law to stomp these monsters out! ?